EDITOR’S NOTE: Updated at 8:30 p.m. EST on Feb. 7 (0130 GMT on Feb. 8) with updated orbital elements. Spectacular live video from numerous cameras around the Florida launch base, and on-board the rocket itself, captivated millions of viewers on television and online as the Falcon Heavy climbed into space, then as its two strap-on boosters returned for a dual-landing punctuated by sonic booms. Once in orbit, the rocket and its cargo — a sleek Tesla Roadster taken from the garage of SpaceX-founder Elon Musk — looped around Earth for nearly six hours, beaming live video of a dummy positioned in the automobile’s driver seat, one arm out the window and the other on the steering wheel. After a long-duration coast, the Falcon Heavy’s upper stage engine reignited to give the Tesla and its mannequin passenger enough speed to break away from Earth’s gravitational grip, sending the car and its rocket stage into an orbit centered on the sun that will travel as far away as the asteroid belt. 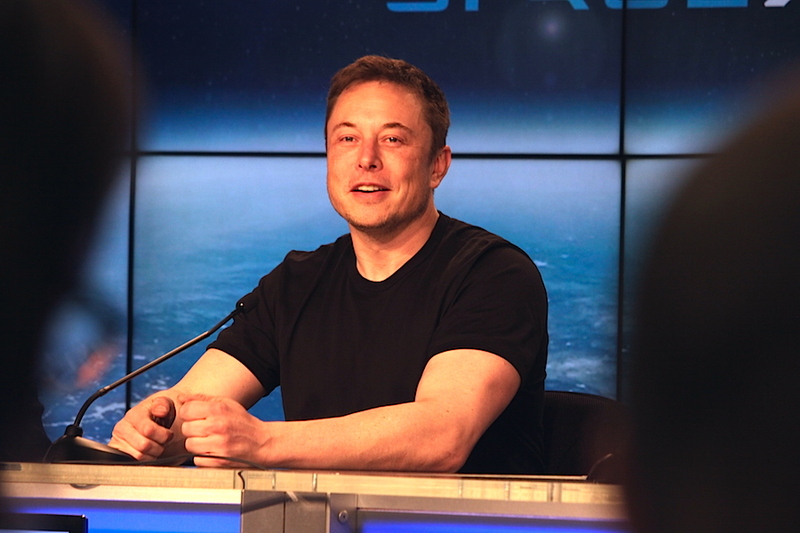 Musk spoke to reporters at the Kennedy Space Center a few hours after liftoff, saying he was thrilled with the outcome of the demonstration mission. Despite the Falcon Heavy’s use of designs proven on the operational Falcon 9 launcher, Musk voiced concerns about the structural stability of the rocket, an untried booster separation maneuver, and a marathon five-hour coast through the cold vacuum of space by the upper stage. SpaceX pushed back the liftoff more than two hours to wait for better upper level winds, and conditions improved just in time before Tuesday’s launch window closed. The Falcon Heavy’s on-board computer sent commands to ignite Merlin engines on two strap-on boosters as the countdown reached T-minus 5 seconds. Two seconds later, the controller ignited the Falcon Heavy’s core stage, sending a fiery exhaust plume out of the flame trench at pad 39A. Hold-down clamps released as the clock ticked to zero, and the behemoth 3.1 million-pound rocket — equivalent to roughly 1,420 metric tons — lumbered away from pad 39A with nearly 5 million pounds of thrust, one-and-a-half times more than any other rocket flying today, and around two-thirds the power output of the space shuttle at liftoff. Rolling on course east over the Atlantic Ocean, the Falcon Heavy’s 27 Merlin main engines sent a window-rattling roar across the Florida launch base as it surpassed the speed of sound and withstood extreme aerodynamic pressures, surviving the buffeting that some engineers worried could tear the rocket apart. The Falcon Heavy shed its two strap-on boosters and core stage for descents back to Cape Canaveral and to SpaceX’s rocket recovery platform in the Atlantic Ocean. 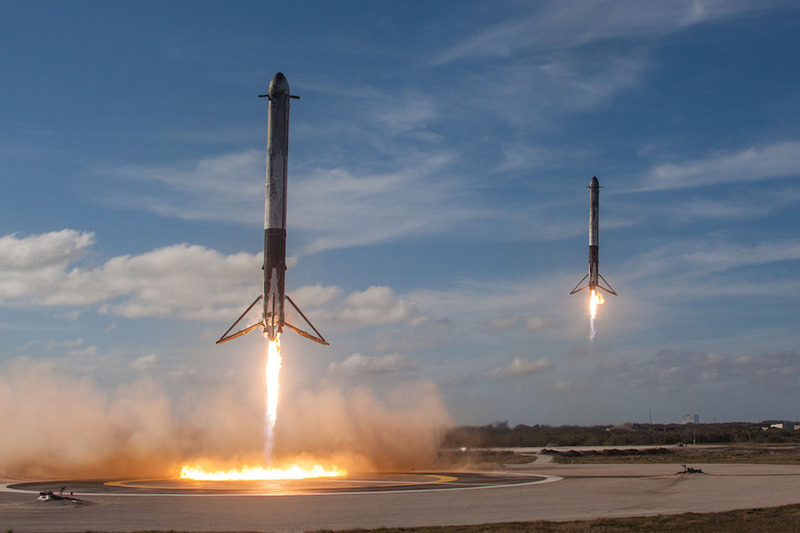 The twin side boosters flipped around with the help of cold-gas nitrogen thrusters, then reignited a subset of their engines to return to Cape Canaveral, where they descended to pinpoint landings on two adjacent concrete pads a few miles south of the Falcon Heavy’s launch complex. The rockets plummeted toward the ground, then fired one engine each to slow their fall moments before landing, touching down seconds apart as a sudden quadruple sonic boom crackled across the sprawling, swampy spaceport. SpaceX tried to recover the Falcon Heavy’s center core on a platform positioned a few hundred miles downrange in the Atlantic Ocean, but that maneuver did not go as well. The rocket’s core stage apparently ran out of igniter fluid, Musk said, and it crashed into the sea a short distance from the uncrewed drone ship, taking out two of the vessel’s engines and showering its deck with debris. But that was the only hiccup SpaceX said occurred on Tuesday’s test flight. SpaceX’s live webcast — set to the tune of David Bowie’s “Life on Mars” and the second most-watched live stream in YouTube history — ended around 10 minutes after liftoff, but the company quickly started another video feed that showed the Tesla sports car drifting in space, with planet Earth receding into the blackness of space. 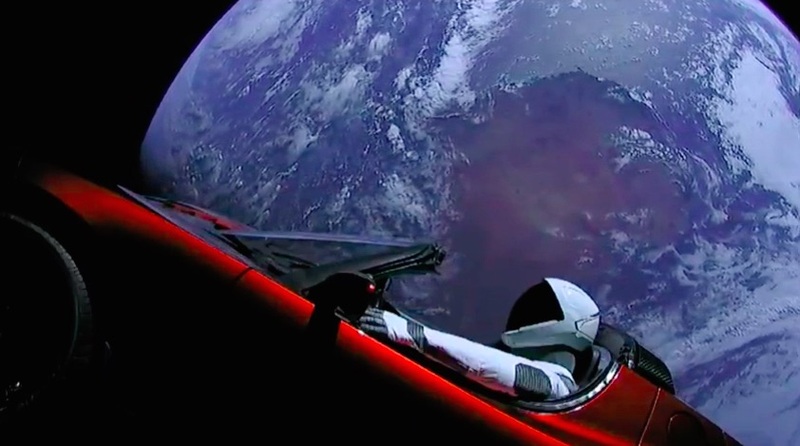 Several camera angles broadcast resplendent views of Earth’s blue marble through the car’s windshield, with the planet occasionally reflected off the Roadster’s cherry red paint scheme and the darkened visor of Starman’s helmet. The mannequin wore a spacesuit developed by SpaceX for future astronaut crews. The company is working on a human-rated capsule that could take NASA astronauts to the International Space Station by the end of this year, or in early 2019. Unaccompanied by commentary or music, the video of Starman conjured many comparisons to iconic science fiction and space opera productions, drawing attention from entertainers, politicians and the public. 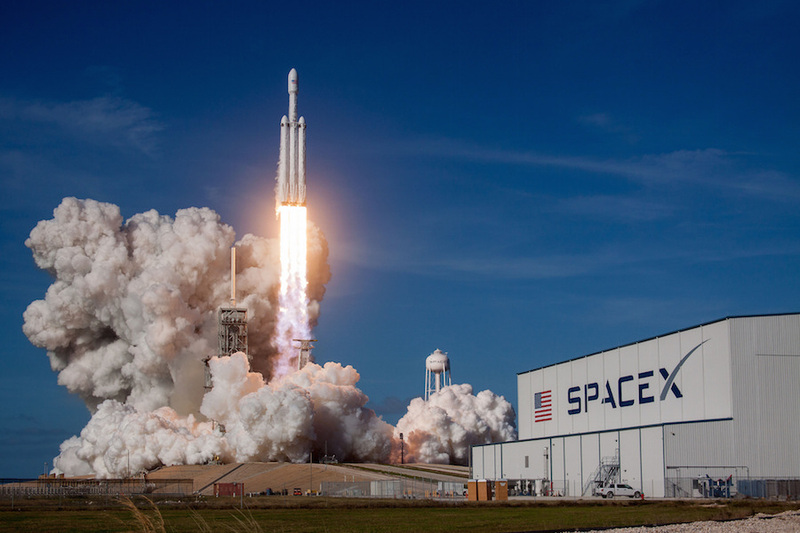 Musk announced the Falcon Heavy’s cargo in December, capitalizing on an opportunity for cross-brand marketing between SpaceX and Tesla, his two primary companies. “You can tell it’s real because it looks so fake,” Musk said of the video. “We’d have way better CGI if it was fake. Musk opted for the Roadster’s launch instead of putting ballast or an experimental craft on the first Falcon Heavy. SpaceX ground crews also placed a Hot Wheels model Roadster on the car’s dash, with a mini-Starman inside. An “Arch” data storage device placed inside the car contains a copy of Isaac Asimov’s “Foundation” novels, and a plaque on the attach fitting between the Falcon Heavy upper stage and the Tesla is etched with the names of more than 6,000 SpaceX employees. Two firings of the upper stage’s single engine sent the Tesla into an elliptical orbit stretching more than 4,300 miles (6,900 kilometers) from Earth before shutting down for a nearly six-hour coast, twice as long as any past Falcon 9 rocket flight. The rocket arced through the Van Allen radiation belts before reigniting its engine to give it an extra boost with enough speed to escape Earth orbit and head into the solar system. Long-duration upper stage flight profiles are required for the most demanding U.S. military launch missions, such as the placement of satellites directly into geostationary orbit, a circular perch more than 22,000 miles (nearly 36,000 kilometers) over the equator. Multiple, perfectly-timed engine burns are needed to move from an initial low-altitude inclined parking orbit into such a high-altitude equatorial position. 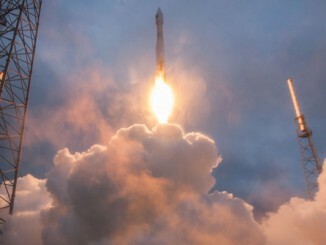 The lengthy upper stage flight Tuesday demonstrated the Falcon rocket family’s capability to pull off such a feat, showcasing the performance to the Air Force and other prospective customers. Musk said before Tuesday’s launch that the upper stage carried additional battery power and pressurant gas for the extra operating time in space. The final upper stage maneuver was expected to deplete the rocket’s kerosene and liquid oxygen propellants. Multiple visual reports from Southern California suggested the Falcon Heavy’s upper stage, the Tesla Roadster and Starman likely completed its Earth departure maneuver around 9:30 p.m. EST (6:30 p.m. PST; 0230 GMT). The sightings shared via social media and by Spaceflight Now readers indicated the rocket flew across the southern sky as viewed from the Los Angeles area. That is in line with the expected track of the upper stage. One reader told Spaceflight Now the object looked like a comet as it appeared in the south-southeast sky in Los Angeles, at an elevation of about 25 degrees above the horizon. The object was moving to the east-southeast. Another reader described seeing multiple “puffs” from the object as it traversed the sky. An all-sky camera at the MMT Observatory on a mountaintop in southern Arizona also recorded the Falcon Heavy’s upper stage as it left Earth orbit. Musk wrote on Twitter late Tuesday night that the third upper stage firing pushed the Tesla and Starman on a trajectory that will take them past the orbit of Mars, and into the asteroid belt, on each lap around the sun. But the orbital trajectory shared by Musk was in error, and the company said Wednesday that Starman is destined for an orbit that will fly around 159 million miles (259 million kilometers) from the sun at its greatest distance, just beyond the orbit of Mars and around 1.7 miles farther from the sun than Earth. The Tesla is not expected to come close to Mars, at least for the foreseeable future. Tuesday’s demo launch marked the first time a rocket of the Falcon Heavy’s power has flown since the last space shuttle mission in 2011. It’s the most capable rocket since the Saturn 5 moon rocket, which hurled Apollo crews to the moon. “The great thing is that the Falcon Heavy opens up a new class of payload,” Musk said. “It can launch more than twice as much payload as any other rocket in the world, so it’s kind of up to customers what they might want to launch. But SpaceX has no plans to launch astronauts on the Falcon Heavy — NASA crews to the space station will fly on the smaller Falcon 9 — and Musk already has a much bigger booster in development to support interplanetary trips with people. The towering Falcon Heavy measures 229 feet (70 meters) tall and 40 feet (12 meters) abreast. It’s not the biggest rocket in the world — rival United Launch Alliance’s Delta 4-Heavy is taller and wider — but the Falcon Heavy’s 27 main engines pack a heavier punch. The Tesla Roadster’s mass — it weighed around 2,760 pounds (1,250 kilograms) on the street — fell well under the Falcon Heavy’s capacity, and would not stress the lift capability of SpaceX’s smaller, single-core Falcon 9 rocket or Atlas, Delta and Ariane boosters operated by rivals United Launch Alliance and Arianespace. The iconography surrounding Tuesday’s test launch was hard to miss, but the star of the show was the Falcon Heavy itself. Comprised of three rocket booster cores derived from SpaceX’s operational Falcon 9 rocket, plus a single-engine upper stage, the Falcon Heavy can generate 5.1 million pounds of thrust in future configurations. On Tuesday’s demo flight, the average thrust from the Falcon Heavy’s 27 kerosene-fueled Merlin 1D engines was expected to be throttled back to 92 percent power, equivalent to roughly 4.7 million pounds, Musk said. That surpasses the European Ariane 5 launcher, the world’s previous operational leader in liftoff power at 2.9 million pound of thrust from two segmented solid rocket boosters and a core engine. SpaceX’s new rocket produced more thrust than any launch vehicle since the space shuttle, and its power at liftoff — approximately the same thrust as 18 Boeing 747 jumbo jets — came in fifth among rockets all time, after the Soviet Union’s N1 moon rocket, which never had a successful flight in four attempts, NASA’s Saturn 5 launcher that carried astronauts to the moon, Russia’s 1980s-era Energia rocket and the space shuttle. The Falcon Heavy is also able to carry more payload into orbit than any other rocket in the world — and the most by any launcher since the Saturn 5 — a more important measure of the rocket’s lifting capacity. The Delta 4-Heavy rocket, the most capable rocket in service outside the Falcon Heavy in terms of lift capacity, can haul up to 62,540 pounds (28,370 kilograms) to a low-altitude orbit approximately 120 miles (200 kilometers) above Earth when launched to the east from Cape Canaveral, according to a launch vehicle data sheet published by ULA. NASA’s planned Space Launch System, set for a maiden flight in late 2019 or early 2020, will carry more than 154,000 pounds (70,000 kilograms) to low Earth orbit and produce a maximum thrust of 8.8 million pounds. A souped-up model of the SLS with an enlarged upper stage launching in the early 2020s could haul more than 230,000 pounds (105 metric tons) to low Earth orbit. The SLS is being designed with surplus space shuttle engine and booster components, and the space agency intends to use the multibillion-dollar mega-rocket to send astronaut crews to the moon, and eventually beyond. If its first stage boosters are not recovered, SpaceX’s Falcon Heavy is capable of delivering up to 140,660 pounds (63,800 kilograms) to low Earth orbit when launched to the east from Florida’s Space Coast, where rockets get a velocity boost from Earth’s rotation. But SpaceX intends to land and reuse at least two — and usually all three — of the first stage boosters on every Falcon Heavy, eating into the rocket’s propellant reserves and reducing the weight it can loft into orbit. The rocket stages on Tuesday’s launch will not be reused, Musk said. The lift performance outlined on SpaceX’s website also assumes the introduction of upgraded rocket stages on future Falcon Heavy flights. The “Block 5” version of the Falcon 9 rocket is expected to debut “in a couple of months,” Musk said, and the uprated boosters will fly on the next Falcon Heavy test launch later this year, likely a rideshare mission with multiple satellites for the U.S. military, NASA and research institutions. A Falcon Heavy rocket flight sells commercially for around $90 million, while a Falcon 9 goes for around $60 million, according to SpaceX’s website. But a Falcon Heavy mission for NASA or the U.S. military, which levy additional requirements on their launch providers, is expected to go for $150 million or more. A mission using ULA’s Delta 4-Heavy rocket costs at least twice that. A Delta 4-Heavy launch contract for NASA’s Parker Solar Probe awarded in 2015 was valued at $389 million. Musk said SpaceX spent more than $500 million developing the Falcon Heavy, roughly one-quarter of the budget NASA has committed to the Space Launch System’s development and construction just this year. Tuesday’s success was not assured. Musk predicted the Falcon Heavy’s first flight had a 50 to 70 percent chance of success. “There’s so much that can go wrong here,” Musk told CBS News before Tuesday’s test flight. 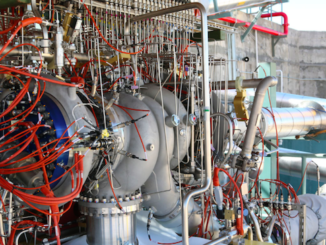 “There are a lot of experts out there saying there’s no way you can do 27 engines, all at the same time, and not have something go wrong. “You’ve got the booster-to-booster interaction, acoustics and vibration that haven’t been seen from any man-made device in a long time,” Musk said. The Soviet-era N1 rocket sported 30 engines, but Russian engineers had trouble getting all of the powerplants to work in unison. 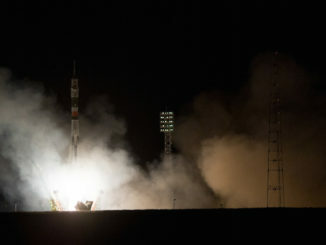 Engine vibrations, turbopump failures and fuel leaks led to four failed launch attempts. By comparison, the Saturn 5 had five larger first stage engines. Musk unveiled the Falcon Heavy rocket in 2011, and proclaimed then the launcher would be ready for blastoff in 2013. 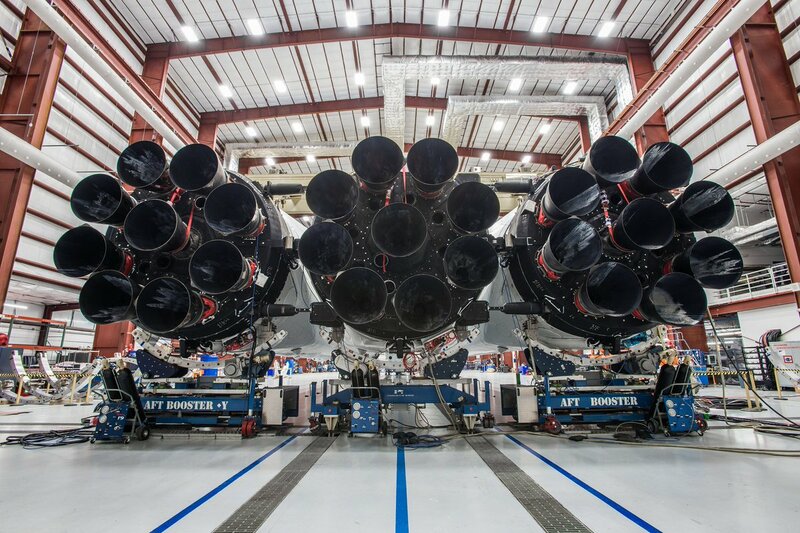 SpaceX said it slowed development of the Falcon Heavy to focus on other projects, including the recovery of Falcon 9 rocket stages for reuse, and to resolve technical problems that destroyed two Falcon 9 rockets in 2015 and 2016, one in flight and another on the launch pad. Musk announced in September his updated vision for settling Mars — SpaceX’s ultimate mission — and announced that his company is working on a giant new rocket dubbed the BFR that could send cargo and crew ships to the red planet, or perhaps the moon if a lunar base becomes reality. SpaceX developed the Falcon Heavy to lift heavier payloads into space than the company’s Falcon 9 rocket, and to compete with other heavy-lifters for contracts to haul massive spacecraft for the U.S. military and NASA. The Falcon Heavy may also find a niche in deploying large commercial satellites, or launching clusters of smaller spacecraft to support the build-out of planned broadband communications networks. SpaceX officials hope many more missions come to the Falcon Heavy with Tuesday’s successful flight. The Air Force’s heaviest satellites are too big to loft on the Falcon 9 rocket, leaving ULA’s Delta 4-Heavy as the sole option for those missions. But the Air Force could certify the Falcon Heavy to carry its most expensive and sensitive payloads once the new rocket makes three successful flights, making it eligible to compete for lucrative contracts that can now only go to the Delta 4-Heavy. The Air Force’s launch officials certified the Falcon 9 for military missions in 2015. Since then, SpaceX has won contracts to deliver two Air Force GPS navigation satellites to orbit. Musk said “a number of commercial customers” have signed up for Falcon Heavy launches. But going into Tuesday’s demo flight, only three more Falcon Heavy missions were confirmed in SpaceX’s backlog: Two for commercial telecom companies Arabsat and ViaSat, and one as a test flight for the Air Force codenamed STP-2. Another company, Inmarsat, has an option to launch a future satellite on a Falcon Heavy.